Questions such as “How to determine the professionalism of a teacher?”, and “What forms of a teacher professional development are the most efficient?” have been a subject of many publications. 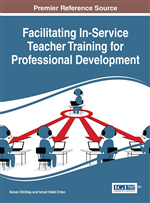 In this chapter, the author focuses on the approach based on a professional designing as a central tool for improvement of professionalism of a teacher. The discussion involves analysis of factors helping teachers to achieve his or her professional goals, such as an ability to model their own practice, analyze students' motives, describe professional goals and challenges, as well as description of various events helping to strengthen those factors. This chapter offers a description of a professional designing: what it is, why it is an important competency every educator should have, forms of events which can be organized to help educators with advancing this particular competency. The main goal of the author is to show how a professional designing helps to ignite and maintain a process of transformative development of an individual or an institutional educational practice. This chapter is based on the practical and research work conducted in Russia (Perm Region) by the author (as a member of a research and consulting team) and represents a shortened version of the PhD dissertation of the author. The theoretical foundation of the research can be found in publications of a prominent member of a so-called Moscow Methodological Circle (or, depending on an interpreter, Moscow Metatheoretical Circle) G.P. Shchedrovitsky (1964, 1966, 1971, 1975, 1979, 1981), and his colleagues, such as N.G. Alekseev (1992) and followers such as A.P. Zinchenko (2014). Applying ideas of the author of zone of proximal development Lev Vygotsky (1926) about knowledge development to social systems Shchedrovitsky et al. (1983) developed one of the strands of the activity theory, with its further application to transformative development of educational systems. One of the centers of active study of how the activity theory can be used to ignite and manage innovations in education was Moscow Institute for Pedagogic Innovations lead by V.I. Slobodchikov (1994), who was the PhD adviser of the author. Many of the faculty of the Institute, including N.G. Alekseev, V.K. Zaretskij, S.I. Krasnov, R.G. Kamenskij, V.R. Imakaev, and others had been actively involved in organizing and supporting various innovations in schools and districts of Perm Region (Russia).